Size: 5.9" x 2.9" x 0.45"
The Canon F-604 is the successor of the F-603 and sports 10 user memories in a nice designed housing. 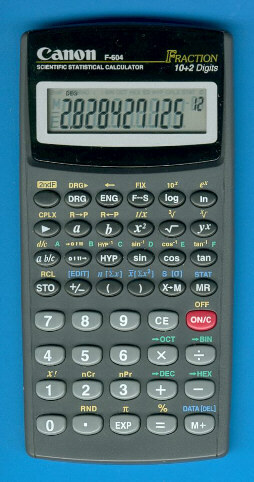 It is a typical scientific and statistical calculator with traditional entry and sports even fraction calculations and binary or hexadecimal arithmetic. Dismantling the F-604 reveals with the leading SRP-1 designation a hint to its true manufacturer. Kinpo Electronics, Inc. is one of the frontrunner in Taiwan's electronic industry and is doing calculator production for well established companies like Texas Instruments, Hewlett Packard, Casio, Canon and Citizen. Running Mike Sebastian's "Calculator forensics" on the F-604 gives an unknown result of 8.9999984382 and we couldn't reveal the manufacturer of its calculator brain. Don't miss the powerful F-720 introduced in the same year.